The Goodbread House sits in the center of the quaint waterfront village of St. Marys, Georgia, America's second oldest city, and the �Gateway to Cumberland Island National Seashore.� Downtown St. Marys is listed on the National Historic Registry. The history of St. Marys dates back to a time when Guale, Timucuan and Yamacraw Indians roamed the area, living off the riches of the land. First came the Spanish Occupation in the late 1500s. The English claimed Georgia in 1663. And in 1787, the British Colonial Council decided St. Marys would be a desirable site for a city. So 20 men got together and agreed to pay $38 each to make a permanent settlement at what was then known as Buttermilk Bluff. Thus, St. Marys was born. The Sandiford-Goodbread House was built in 1870 by Samuel Burns, who sold it to Ralph Sandiford, who in turn sold it to steamboat captain Walton Goodbread in 1901. The Goodbread (Gutbrodt) family had come to Philadelphia from Germany in 1731. Descendents of Phillip Goodbread Sr. migrated south during the war, eventually settling in Camden County. They fought in the Revolutionary War and the War of 1812, and served in the Confederate Army in the Civil War. In 1918, Kate Brandon Bagwell and her sisters, Sallie, Semora, and Ethel, bought The Goodbread House to house the overflow of the Riverview Hotel, a neighboring Inn just steps from The Goodbread House now run by Jerry Brandon and his wife, Gaila, former proprietors of The Goodbread House. 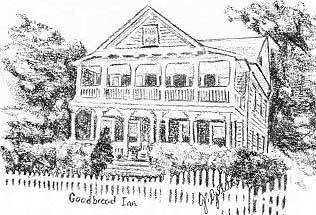 More recently, The Goodbread House served as Dixon's Boarding House, serving family-style lunch and dinner to locals and visitors alike. It was renovated in the early 1980s, and today retains the charm of its original 1870s architecture.